North Ridge Alzheimer's Special Care Center offers private and semi-private suites for residents with both memory care and respite care needs. We offer a full-time, on-site nursing staff and group of dedicated therapists to assist in the healing process and bring support and meaning to each of our residents. Respite Care: We offer short-term assisted living care for residents recovering from a hospital stay or who are in need of rehabilitation. Our dedicated therapists are ready to help our respite guests get back on their feet. Memory Care: Alzheimer’s is a devastating disease for both seniors and their loved ones. North Ridge Alzheimer's Special Care Center offers our own Meaningful Moments® program to help inspire and comfort those in our care with Alzheimer’s and dementia-related needs. Our team works with the resident’s family to ensure the right care plan for each individual is created and acted upon. 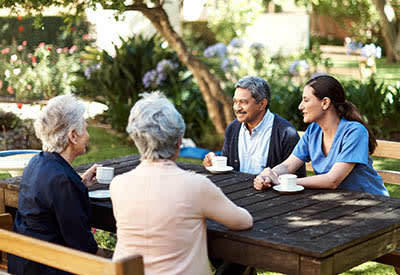 Both memory care and short-term assisted living residents are able to choose from private or semi-private room options and have access to our transportation, excursions, exercise classes, arts and crafts projects and more. Are you ready to hear more about the senior services available at North Ridge Alzheimer's Special Care Center? Call to schedule a tour today.